GT Sport was first shown off a year ago, and it looked like a slightly shinier (but also less slick in terms of frame rate) version of Gran Turismo 6. But all that’s in the past. GT Sport is absolutely gorgeous. The game moves at 60fps unless you’ve got ten cars on the screen in which case it drops the occasional frame. Replays move at 30fps, which is fine, since they have extra effects on them to make them look gorgeous. While the trees can look a little flat, and in-car views a little sterile, the overall look is wonderful. The lighting, in particular, is a massive step forward, and the quality of the glare when you face the sun in cockpit view is just magnificent. When you start the game, you’re given a variety of control options, and some of them are retrotastic. If you remember the days of the original Gran Turismo on PSone, you’ll be pleased (or at least tickled) to see there’s an option for digital steering input via the d-pad. But that’s not all! Fans of Gran Turismo 3: A-Spec who lamented the DualShock 2’s lack of analogue triggers will likely have done their accelerating and braking via the right analog stick. That option’s available here too. But don’t worry, ‘normal’ controls with the left stick and triggers are the default. There are two ranking systems in GT Sport – a driver rating and a sportsmanship rating. Everyone starts at E on the driver rating, and that improves as you play, remembering how much you stay on the road and where you finish in races. But the other stat is all about collisions with other cars. Even though the game ghosts out any drivers who fail to brake in normal places (ie. looking to shunt someone up the rear), it’s still totally possible to nudge someone off the track. The best way to do this is to cut across their front and divert them off course. I know this because it happened to me ALL THE DAMN TIME. 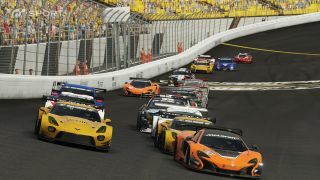 The ‘Sport’ mode is the only one available to play in the Beta, and it features three races: A, B and C, which each have a clearly visible set start time in real world timing. But you can’t just enter them; you need to qualify for them first, using the FIA’s usual 108% rule to make sure everyone on the grid is at least semi-competitive. You can set as many qualifying laps as you like before the race. You’ll get a countdown to matchmaking beginning, and you’re taken out of the game when that happens. You do need to remember to enter the race after qualifying though, it won’t enter you for anything unless you say so. After matchmaking, everyone is let loose from the pits onto the track for a warm-up, before the race proper begins. The upshot of all this is that you spend most of your time on the track, not in menus and lobbies. The progression of play works superbly. Having a super-fast connection (for the UK at least) doesn’t mean the races are flawless. Ping time is displayed in the top-right of the screen and varied for me between 20ms and 120ms. But the green bars were always completely full, suggesting my connection was more than adequate. Even so, there was quite a lot of lag from many of the other cars, as they seemed to crash off the track but then reappear back on it on the normal racing line. Some would jitter down the straight, too. If it gets really bad the game does appear to grey them out so they don’t smash you off the track, but it doesn’t look as solid as it probably should by now. We’ll see if this improves, or whether the full version lets you limit connection quality in the menus. What is it with racing sims and disparity? GT Sport’s Beta awards you new cars for completing challenges – for example a ‘marathon achievement’ for doing more than 26 miles in one day. The cars you win can be used in races, but that means there’s an obvious disparity on the track. It doesn’t matter how well you’re driving, someone with a faster engine will drive past you down the straight. It’s close enough to at least resemble a race, but it would be so nice to have a straight fight, just once. Hopefully the real game will have more single-car races to enjoy. The soundtrack is nothing like a 1920s speakeasy, which is awesome. In fact, while not quite up to the raucous, bombastic Gran Turismo 3: A-Spec, the majority of in-game music is most definitely rock, evoking memories of the very first Gran Turismo on PSone. Post-race victory screens capture the romance of motorsport, with ultra-slow motion movement on a driver in a victory pose. It’s very clean, very assured, but definitely not soulless. And it doesn’t fawn over the cars, instead presenting them in supreme clarity and letting you do the drooling. It’s grown up from GT3, but isn’t a granddad like GT5. A logical progression from GT6, then. Besides a smattering of real-world courses including the ever-awesome Brands Hatch (in both its GP and Indy layouts) and Willow Springs, one course in the Beta really caught my eye. Dragon Trial is a phenomenal, fictional circuit set by the sea and taking in lush woodland and a small town area. Every single corner has something to offer in terms of challenge or just plain enjoyment. That sounds obvious, but you’d be surprised how many modern racing games neglect this fundamental aspect. Highlights include the chicane before the tunnel near the end of the lap, and the flat-out right hander that leads into a much tighter one, which then opens out gloriously over the crest of a hill. It’s utterly gorgeous to drive.